Develops coordination, rhythm and large motor skills using creative movement, music, tumbling and ballet basics all while instilling a love of dance. This class provides the basics in ballet and tap at the barre, center and across the floor as well as 10 minutes of tumbling. Emphasizing proper technique, musicality, body awareness and classroom etiquette. The perfect class for the younger student. Simply put....The foundation for all dance. All classes include barre, center and across the floor work encompassing various levels of adagio, port de bras, petit and grand allegro. Students will learn proper terminology associated with all movement and steps as well as developing a strong center, body placement, balance, gracefulness and precise technique. Age - Instructors discretion, usually around 12 with an adequate foundation in ballet technique. Must be enrolled in ballet technique classes. All upper level Jazz dancers must be enrolled in a ballet technique class. Focusing on technique in warm ups, progressions and center combinations developing control and flexibility through the use of isolations, turns and jumps. Lyrical will utilize the above but add in more expression of the music. An energetic street style taught to age appropriate popular music. Students will learn musicality and how to rhythmically interpret the music during center, across the floor and freestyle combinations. Dancers will experience technique that explores resisting and yielding to gravity, contraction and release as well as fall and recovery, through leverage, balance, movement dynamics and breath. Students will develop rhythm, coordination and clarity of sounds, while learning tap's founding skills and some of today's newest steps. This class will allow children of all experience levels an opportunity to discover their individual talents, creativity, and performing interest through musical theater. Young performers work collaboratively to explore character based acting, song interpretation and choreography. The biggest attributes you bring to Silverton are not those related to building a successful business, but to nurturing and celebrating the children you teach. Everyone is welcomed, everyone is encouraged. Your students learn that with consistency, attention, hard work and practice they can accomplish amazing things. All in an atmosphere of love and fun and joy. If the class that you want is full simply place the day/time of the class in the "notes" section of the registration form, and we'll place you on a waiting list. Class enrollment can often change for a variety of reasons........we'll try our best to find just the right place for you at Silverton Ballet! NOTE: Class schedule is subject to change. Please call the studio to check class availability and correct class placement. 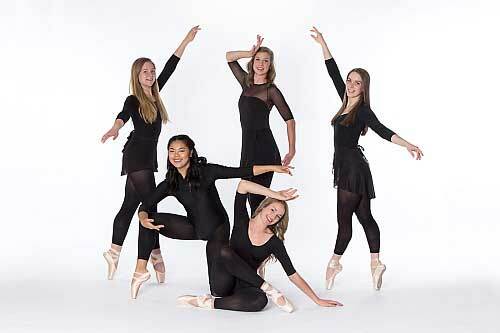 Silverton Ballet and Performing Arts Company work study program is designed to provide students at the intermediate level and higher with an alternate method of tuition payment. The ability to improve a dancer's technique is directly related to the number of hours of study per week. An increase in classes means an increase in time commitment for both the parent and the student, as well as an increase in cost. Our work study program enables students to offset at least a portion of their tuition by assisting at the studio during the year. The added benefits are many. By working with a lower level, the dancer improves the basic level of his/her own technique. And for the younger dancer who has an interest in becoming a teacher, the experience of working with children under the tutelage of an experienced professional is invaluable.